Opened in June 2013, the new Cleveland Convention Center is a LEED-certified facility with a 225,000 sq. ft. exhibition hall. Connected to the convention center is the Global Center for Health Innovation which is a four-story office complex dedicated to education and commerce through state-of-the-art spaces, programs and virtual offerings while building on the heritage and distinctive capability of Northeast Ohio health care. The Cleveland Convention Centered partnered with iVideo Technologies in Cleveland, OH to install a massive CastNET digital signage system throughout the convention center and the Global Center for Health Innovation. • Meeting room and Informational signs provide information about events happening that day. • Promotional signs. It is very important to the convention center that the signage system effectively promotes and brands the facilities, the city, the clients and the sponsors. The digital signage system includes 90 directional signs, 38 meeting room signs, five video walls, and 43 informational signs next to elevators. As with most large venue projects, the installation of the digital signs started behind schedule since it was started towards the end of the project. iVideo assigned their best service manager, Ron McGlothlin, and CastNET assigned their best technician, Kim Jones, to coordinate the successful deployment in time for the opening. Two of the five 3x2 video walls were difficult to install due to the design in Lake Side Lift area. 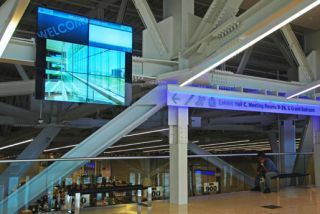 The integration company, iVideo, designed a special rigging so that two video walls could be mounted to structural beams. And while the original plan was to install a player behind each sign, this was not possible due to space limitations. Many of the players are installed in an equipment rack with an Extron Video Extender. The signal is sent over Cat5 cable using HDMI, DVI or Displayport. CastNET Digital Signage Content Management Software was selected because it’s an enterprise level software that is powerful enough to support this large deployment and to grow even larger in the future as the installation is expected to evolve. The CastNET server is Dell. The CastNET players are either Dell or Seneca Data. The Video Walls are Samsung. The meeting room digital signs are Philips. The information signs are from LightWild. To provide leading edge technology and comply with LEED, the convention center installed 90 advanced RGB LED signs from LightWild. CastNET was customized to include a special color command so that CastNET controls the background color of the LightWild signs. Over a million colors can be selected – very unique capability. A special single-line LED text reader board is outside of each exhibition hall entrance. CastNET includes a color command for the reader signs. CastNET developed an interface for Ungerboeck Events Management Software. As event data is entered into the software, it’s automatically scheduled to be played on the CastNET system. Brian Cook, Technology Manager at the convention center, reports that the digital signage system has been a 100% success– and has been easy to update and administer. The LightWild signs allow the convention to be easily branded for a major client who is using the facility by matching the screens background color to the client’s corporate colors. The video walls have been used to successfully promote both the facility and the city. The 32” digital signs outside of the meeting rooms provide enough screen space to include both the schedule for the room’s meetings and promotional information about the facility and the city. The signs installed outside the elevators provide clear directional and schedule information. And, as important as any consideration, the system is powerful enough to support the future expansion when the Global Center installs a new kiosk and touch screen exhibition area.